Dorene L. Noe, 86 passed away peacefully on Sunday Sept. 16, 2018 at her home in Morristown. 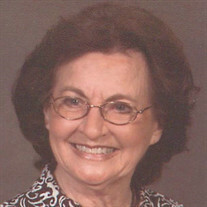 She was a member of First Baptist Church and of Teresa Daniels Sunday School Class. She dearly loved her fellowship and friends in her class. Her loyal heartfelt support went to 'Love A Child', 'Harvest of Israel', Missions and her church. Dorene was preceded in death by Husband, Lloyd M. Noe of 60 years; Son, Tracy D. Noe; Father & Mother, Lon & Mae Livesay; Brothers, Glen Livesay, J. T. Livesay (Meta); Sisters, Imogene Harris (Glen), Geraldine Murph; Father-in-law & Mother-in-law Walter & Virgie Noe; Sister-in-law Mildred Bibbins (Henry), Brother-in-law Billy Ray Noe (Sandy), and Bruce Carmon, one niece & four nephews. Survivors include her Brother, Ronnie Livesay; Daughters, Janet Southerland (David), Melissa Zimmerman (Joe); GrandChildren, Josh Noe (Lenzie), Wes Southerland (Abby), Drew Southerland (Cara), Matt Noe, Megan Cameron (Justin), and Chelsea Lower (Aaron). Mammaw's Great GrandChildren are Mckinley Noe, Emma & Olivia Southerland, Lola & Sawyer Southerland, Madison Lower and Lennox Cameron. Brother-in-laws Lewis Murph, Harold Noe (Phyllis); Sister-in-law Katie Carmon many nieces and nephews. Pappaw's loved dog Sissy. She had supportive friends and neighbors over the years she was greatful for their love, help and caring (thank you). Family would like to say thank you to Avalon Hospice their special care & support. Thanks to those who prayed for God's will after Mom or Mammaw's accident. We choose to live by Faith not by Sight. Visitation will be Wednesday, Sept. 19th from 4:00 to 6:00 pm at Mayes Mortuary funeral services to follow by Rev Danny Georges & Rev Dale Harris. Graveside services will be Thursday, Sept. 20th at 1:00 pm at Hamblen Memorial Gardens Mausoleum, Russellville. TN.